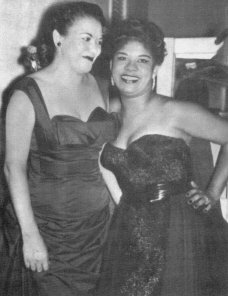 "They Call Me A Fool"/"Let Me Be The First One To Know"
Above: Photo of Savannah Churchill (Left) and Ruth Brown backstage in 1956. 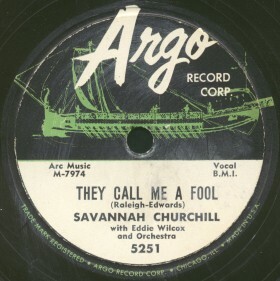 Above Left: Savannah's only release on Chicago's Argo label (owned by Chess). She was injured sometime in 1956 due to a freak accident during an appearance at Milwood Club in Brooklyn, NY. 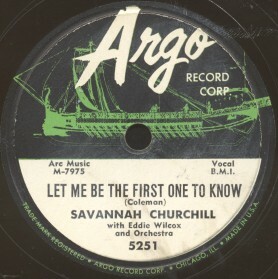 Savannah apparently didn't record again until the early 1960's for Jamie, but this "comeback" went nowhere. Above Right: The flip side. A pleasant song done to a waltz tempo. Click on an option below to listen to "They Call Me A Fool" using RealPlayer. Click on an option below to listen to "Let Me Be The First One To Know" using RealPlayer. TO VISIT THE SAVANNAH CHURCHILL WEB PAGE, PLEASE CLICK HERE.